While Jim tinkers with the upper thread adjustment (with aid of a flashlight) he places a patch under the presser foot to prevent the feed dogs from rubbing against the presser foot. The light also comes in handy for threading the needle. Serial number of this machine is EJ477335 and made during 1954. The machine requires a special bobbin and case and 206x13 needle. The 306 has most of the capabilities of older mechanical units without cams. It will sew a straight lockstitch as well as sewing zig-zag. Some of these machines--the 306W--uses cams to make decorative stitches. Our other Singer 306 is a tan 306W shown below. It has capability to do fancy stitches with the use of cams. A black phenolic cam is installed behind the chrome button seen on the machine's top-right. 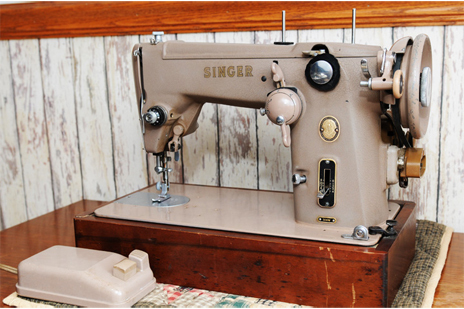 The image above shows a tan Singer 306W and a tan foot control. Serial number of this machine is WI579379 and was purchased near Murphy, North Carolina. It has a crinkle finish which is very difficult to clean and remove dried lubricants. In fact, we--or someone else--have sprayed a cleaner on the machine which has spotted its finish. The image above shows the backside of our 306. The motor and light are made of a phenolic-like material that is a different color than the machine and we assume it is due to ageing. We had to rewire the light as there was as much bare wire exposed as insulated wire when we purchased it. Rewiring the light was an all-day project complicated by removing and reinstalling three snap rings that hold it together. A real test of your religion. Another problem we have encountered with our machine is the stitch-length regulator. We are having difficulty in adjusting the control so that the same length stitch is obtained when moving from forward to reverse sewing--probably an adjustment somewhere. Singer 306W bobbin installation is a bit of a chore. 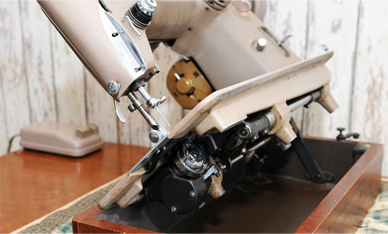 While many machines offer a slide plate providing bobbin access, this machine does not. To access the bobbin, the machine is tilted back as shown above. There is a latch on the right-hand side which supports the machine in this position. For someone with fat fingers, this method may be preferred to trying to install a bobbin and bobbin case beneath a slide plate. The 306W uses a vertical bobbin which many quilters claim makes a finer stitch--especially free-arm quilting--since bobbin thread doesn't have to make a 90-degree turn before reaching fabric. It spools in a relatively straight line up to the work area. You MUST--repeat MUST--use a Singer 206X13 needle. 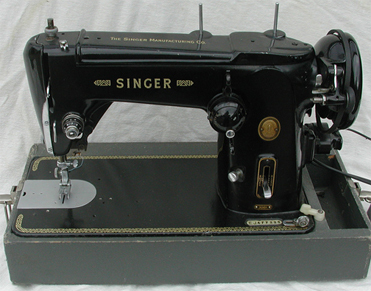 If any other needle could be used in this machine, Singer would have figured out how to do it years ago. Some of these machines have been "retimed" to use other needles but that proves unsatisfactory when doing anything but straight stitch. 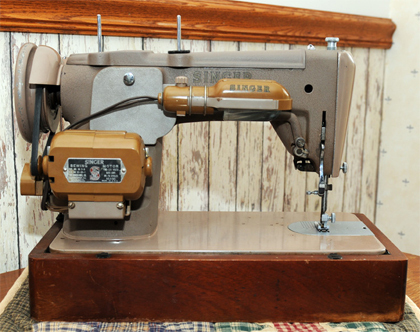 It will accommodate twin needle sewing using a 306x1 needle. Good luck in finding one. 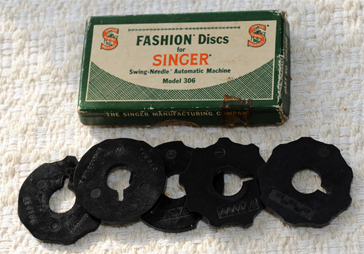 Singer refers to the 306W as an "Automatic Swing-Needle." 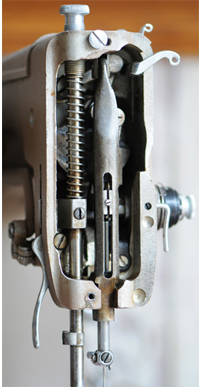 The 306 needlebar swings from a top-mounted pivot point and is pushed back and forth by an exposed rod on the rear of the machine. Part of the mechanics can be seen in the above image of the machine's rear. Odd but effective, but it does seem to add several critical lubrication points which may not be easily accessible in mounted models. 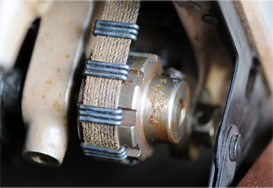 Singer 306 uses a fiber belt to connect the upper thread drive and lower thread drive. We have never had any trouble with these belts, but can't imagine them lasting forever like all metal gear-driven machines. If we were looking for a real worker, we surely would give this belt a close examination. We don't know of a source for replacement belts. Our machine came with six Fashion Discs numbered 1 - 6. Patterns produced with each of the discs is shown below. Stitch width was set at constant maximum (5) for the example but it can be adjusted for various effects. 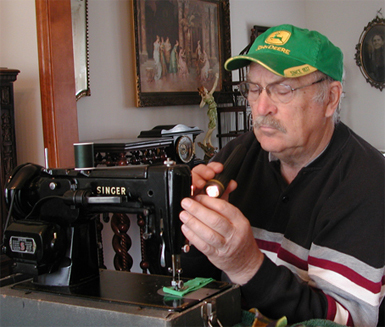 A warning on the box says, "CAUTION: Always operate machine with disc, even when doing straight sewing." Not sure why? I assume from the caution note that you need to ensure at least one disc comes with your machine. it doesn't seem to matter what disc is used as long as stitch width (not length) is set to minimum. Go to the bottom of our webpabe for Singer 319 to see a complete list of patterns (including Numbers 1 - 6 above) that can be made using Singer Fashion Discs.